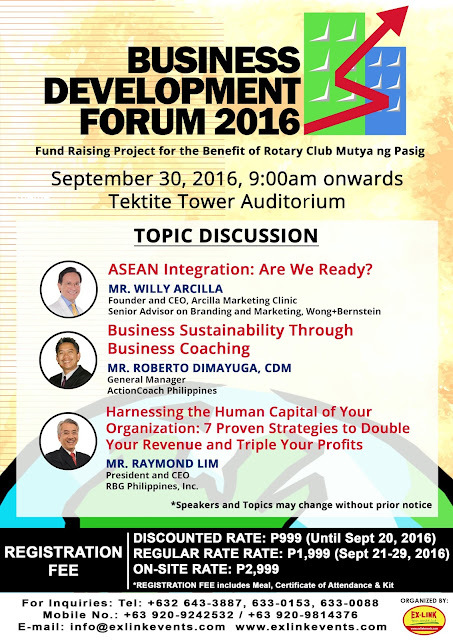 Join the Business Development Forum 2016 this September 30! Calling all businessmen in the Ortigas-Mandaluyong area - join the Business Development Forum 2016 this September 30, Friday, 9:00am onwards, at the Tektite Tower Auditorium in Ortigas Center, Pasig City. The Forum features key resource speakers in business talking about insightful and inspiring topics that are fit for the improvement of your business, such as Wong+Bernstein Senior Advisor on Branding and Marketing Mr. Willy Arcilla, ActionCoach Philippines General Manager Mr. Roberto Dimayuga and RBG Philippines CEO Mr. Raymond Lim. The early registration fee of Php999 is until September 20, 2016. On-site registration fee is Php2,999. Registration fee includes meals, certificate of attendance and event kit. For reservations and inquiries, contact 643-3887, SMS 0920 924 2532 or email info@exlinkevents.com. 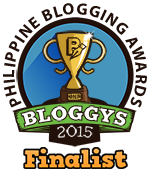 This event is a fund-raising project for the benefit of the Rotary Club of Mutya ng Pasig. Program is subject to change without prior notice.